Directions: Cast on 90 stitches. ROW 1: Knit one row. ROW 2: K2, K2tog, YO, K2tog, Knit to end of row. Repeat row 2 for every row until only 7 sts remain. Bind off all 7 stitches. Optional Fringe: If you prefer, cut off several pieces of 5 inches for fringe. Fold 2 pieces of yarn in half for each bit of fringe. Space the fringe evenly along triangular edges of shawl. 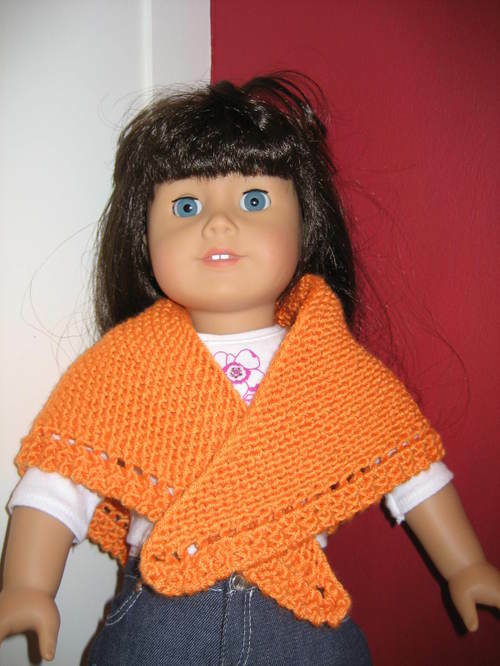 Pull through the bottom row of the shawl with a crochet hook and then pull through the loop of the fringe. Pull tight. Trim fringe.